Place first 10 ingredients in food processor and blend well. Set aside. Dice green onions, chop artichokes into semi-large chunks and shred spinach into strips with knife. Add to large mixing bowl. Add crab meat to bowl in addition to content of food processor. Stir until well combined. 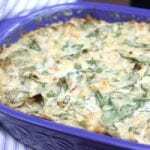 Spray a medium sized casserole dish, approximately 9 1/2" x 7 1/2", with non-stick cooking spray. Bake uncovered for approximately 40 minutes or until cheese is thoroughly melted. Serve hot with sliced baguette or tortillas chips. Tastes wonderful cold also.